Trump Has Been Lucky in His Enemies Cursing pols, screeching students and intolerant abortion advocates have become the face of the left. Donald Trump’s tax-reform plan strikes me as daring. Whether it’s the daring of bright children or the daring of shrewd professionals who’ve gamed it out with the Hill remains to be seen. The simplification part is good and will be received as a balm by the taxpayers. Ronald Reagan once said even Einstein was driven to distraction by his tax forms, which explained his hair. The proposed cuts themselves are certainly big and blunt; economic and social thinkers will weigh in soon on whether they’re wise or just. Refusing to eliminate the deductions for mortgage interest and charity was a dodging of bullets. I’m not convinced the former is fair: It’s hard to see the higher justice in treating homeowners better than renters. Maybe a real-estate lobbyist will explain. The latter was I suspect the work of the New Yorkers in the White House. Opera, ballet and theater all come out of New York, home too of the greatest museums and libraries. If the charitable deduction goes away, their contributions go down. If the greatest opera goes down in New York, that art form no longer exists in America. And a great nation must have opera. Apart from that, wealthy New Yorkers, such as people at Goldman Sachs, enjoy being on the great arts boards, and cutting the deduction is no way to accomplish that. God bless social ambition as a force for good. Now to a hundred-day summation—three thoughts after observing the past three months. If this thing works—if the Trump administration is judged by history as having enjoyed some degree of success—it will definitively open up the U.S. political system in a wholly new way. Before Mr. Trump it was generally agreed you had to be a professional politician or a general to win the presidency. Mr. Trump changed that. If he succeeds in office it will stay changed. Candidates for president will be able to be . . . anything. You can be a great historian or a Nobel Prize-winning scientist. You can be a Silicon Valley billionaire. You can be Oprah, The Rock, or Kellyanne. The system will attract a lot of fresh, needed, surprising talent, and also a lot of nuts and poseurs. But again, only if Mr. Trump succeeds. If he doesn’t, if he’s a spectacular failure, America will probably never go outside the system like this again, or not in our lifetimes. If the Trump administration ends in failure or disaster, we will realize in retrospect that 2016 handed us a perfect historical irony. Donald Trump was the only Republican who could have won the GOP nomination. He was the shock the base wanted, the strange, magical Wonder Pony who could break through a broken system. He was also the only Republican who could have won the general election. But he could also prove to be the only Republican who could not succeed in office. The others—John Kasich, Jeb Bush—actually knew how to govern, knew all the systems and traditions, knew what was required by high office and what was not allowed. So the only one who could win was the only one who couldn’t do the job. If that happens, it will be some kind of irony, if irony’s the word. This is said to be an attempt to get down with millennials. I know a lot of millennials and they’re not idiots, so that won’t work. The perennially sunny Rep. Maxine Waters of California called Mr. Trump’s cabinet “a bunch of scumbags.” New York’s junior Democratic senator, Kirsten Gillibrand, has taken to using the F-word in interviews. I thought Mr. Trump was supposed to be the loudmouth vulgarian who swears in public. They are aping what they profess to hate. They excoriated him for lowering the bar. Now look at them. And they’re doing it because they have nothing else—not a plan, not a program, not a philosophy that can be uttered. Imagine a great, lost party defining itself by who it’s throwing out. They’re like the Republicans the past 20 years, throwing people out for opposing Iraq or George W. Bush, or for not joining NeverTrump. Where does this get you? It gets you to where we are. That most entrenched bastion of the progressive left, America’s great universities, has been swept by . . . well, one hardly knows what to call it. “Political correctness” is too old and doesn’t do it justice. It is a hysteria—a screeching, ignorant wave of sometimes violent intolerance for free speech. It is mortifying to see those who lead great universities cower in fear of it, attempt to placate it, instead of stopping it. When I see tapes of the protests and riots at schools like Berkeley, Middlebury, Claremont McKenna and Yale, it doesn’t have the feel of something that happens in politics. It has the special brew of malice and personal instability seen in the Salem witch trials. It sent me back to rereading Arthur Miller’s “The Crucible.” Heather Mac Donald danced with the devil! Charles Murray put the needle in the poppet! As in 17th-century Salem, the accusers have no proof of anything because they don’t know, read or comprehend anything. 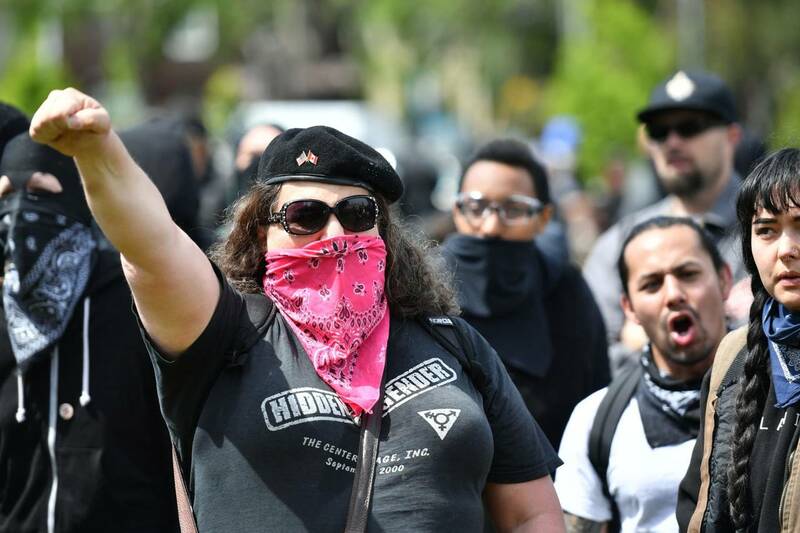 The cursing pols, the anathematizing abortion advocates, the screeching students—they are now the face of the progressive left. This is what America sees now as the face of the Democratic Party. It is a party blowing itself up whose only hope is that Donald Trump blows up first. He may not be lucky in all of his decisions or staffers, or in his own immaturities and dramas. But hand it to him a hundred days in: He’s lucky in his main foes.